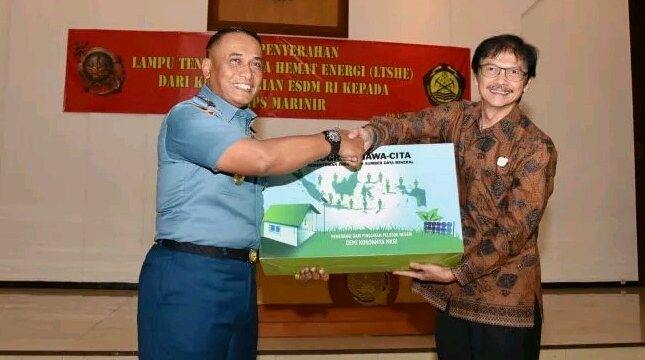 INDUSTRY.co.id - Jakarta - The Ministry of Energy and Mineral Resources (ESDM) through the Directorate General of Renewable Energy and Energy Conservation (EBTKE) handed over 200 units of Solar Energy Saving Lamp (LTSHE) to the Marine Corps. "It is also one of the programs of the Ministry of Energy and Mineral Resources, specifically for the Indonesian Armed Forces (TNI), from the beginning we have designed. We want our brothers who are tasked with guarding the Unitary State of the Republic of Indonesia (NKRI) and are on the outer islands or borders, a little more helped by this," said Director General (Director General) EBTKE, Rida Mulyana at Graha Marinir Panti Perwira, Friday (19/1/2018). Rida also said that giving lights is not an aid, but a support for the marines in carrying out the duty of the state. "We can really imagine how difficult our friends are there, hopefully what we do today is a lot of benefits for the country," said Rida. LTSHE program is indeed specially designed by President Jokowi and Minister Jonan to realize justice. Currently there are many brothers who are in the forefront, the outermost, and left behind have not felt electricity. "Pak jokowi happened to have poured nawacita, and then this program must be finished in 2 years, 2017 and 2018. There are still 2,519 villages that are still dark and it is all our brothers, the most touched, if we go to the area, they are with Language Indonesia is eloquent and holding tight red and white, when asked what it wants, only one is requested, my father wants lights This means that lighting They do not ask for electricity, therefore LTSHE program is the right one, although its temporary while waiting for PLN come," said Rida. On the same occasion, Commander of the Marine Corps Maj. Gen. Bambang Suswantono also expressed his gratitude for the support from the Ministry of Energy and Mineral Resources for the Marine Corps on this LTSHE program. "I'm sure this lamp will be useful for my soldiers, who are on the outer islands, then our border squads, and our other units when practicing in the forest, on the beach, wherever we are, find the lights, hopefully this will benefit us all," said Bambang. As is known, the provision of LTSHE is one of the implementation of the Nawa Cita of the President of the Republic of Indonesia (RI) program in the ESDM sector to meet the needs of people who are not yet connected to power lines in border areas, underdeveloped regions, isolated areas and outer islands. The provision of LTSHE is regulated in Presidential Regulation No. 47 of 2017 on the Provision of Solar Energy Saving Lamps for Communities that Have Not Gained Access to Electricity and its derivative rules namely Minister of Energy and Mineral Resources Regulation No. 33 of 2017 on Procedures Provision of Energy Saving Solar Lamps for Communities that have not Getting Electrical Access.